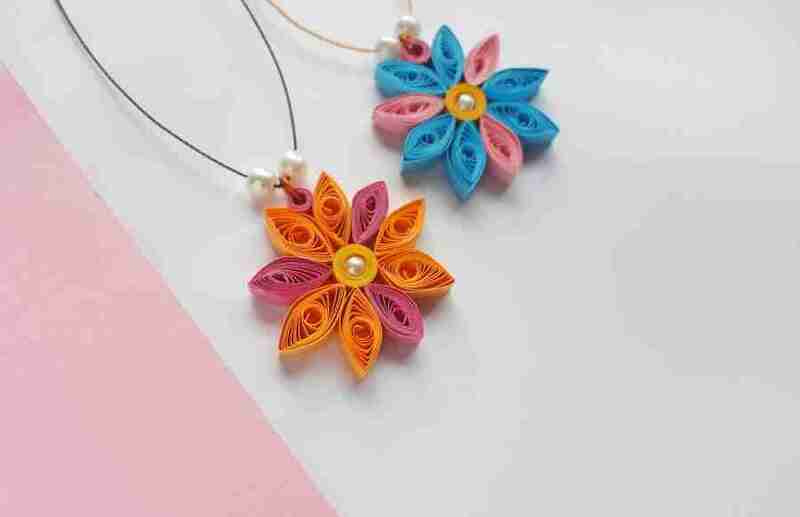 Easy Quilled Paper Flower Necklace Craft | Mothers Day Gift Idea! 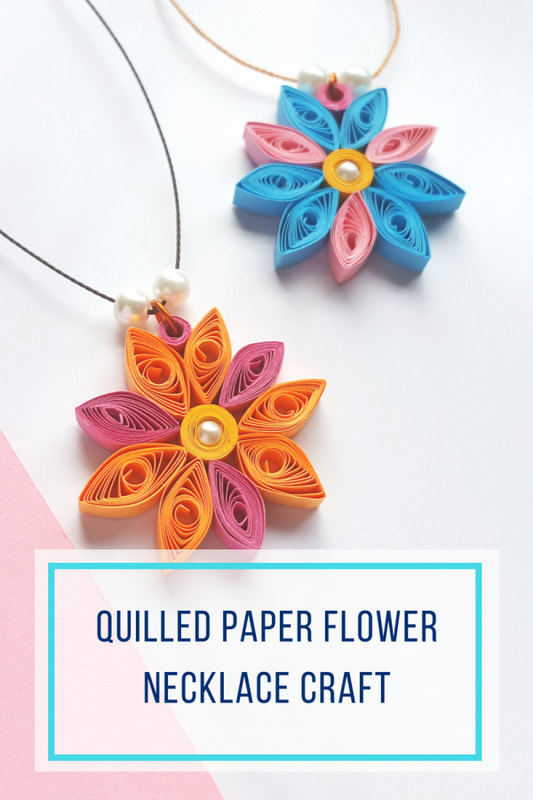 This quilled flower necklace craft is super easy and fun for kids (and adults) to make and provides the perfect gift to give to Mom for Mother’s Day! This flower necklace craft is one of my favorite activities to share with kids and teens. It lets them use their creativity and show their own personal style. You’ll be amazed at how much you can change up the look of your necklace by changing paper colors, adding additional embellishments, and even changing up the shapes and sizes of your paper petals! 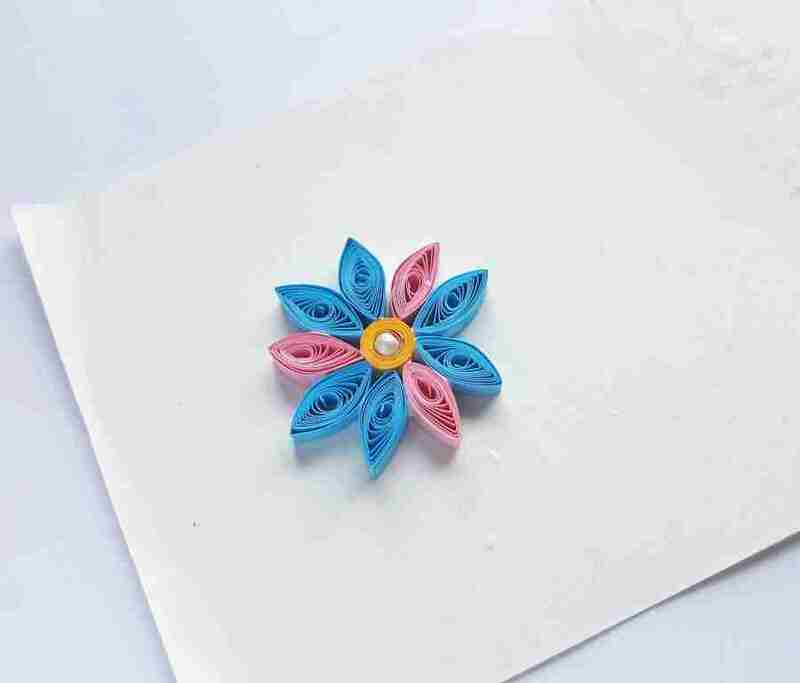 Pick a paper strip for the center of the flower. Use the slotted quilling tool to quill the strip. making sure that the coil is secure. Let the coil to loosen up a bit. 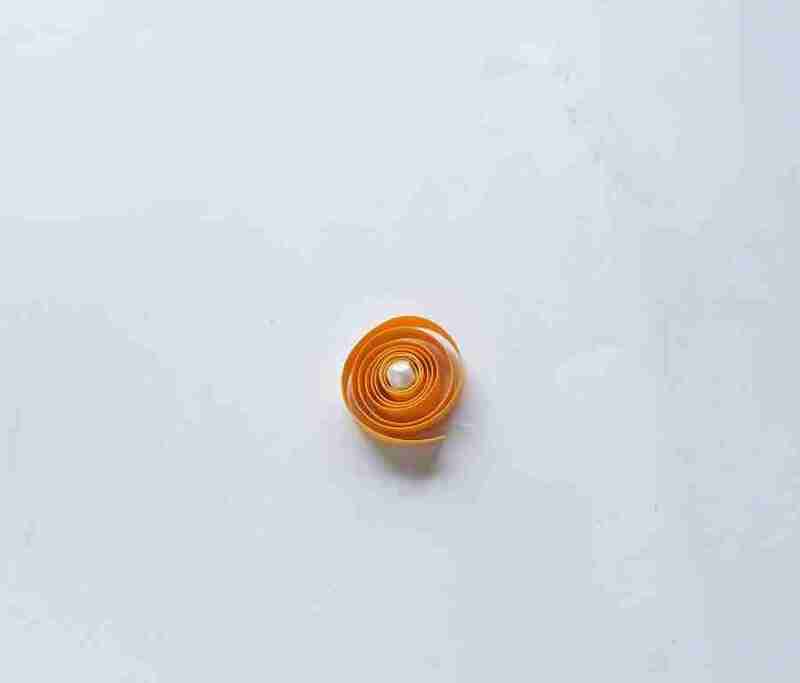 Place the loose quilled strip on a flat surface and attach a small faux bead on the center with glue. 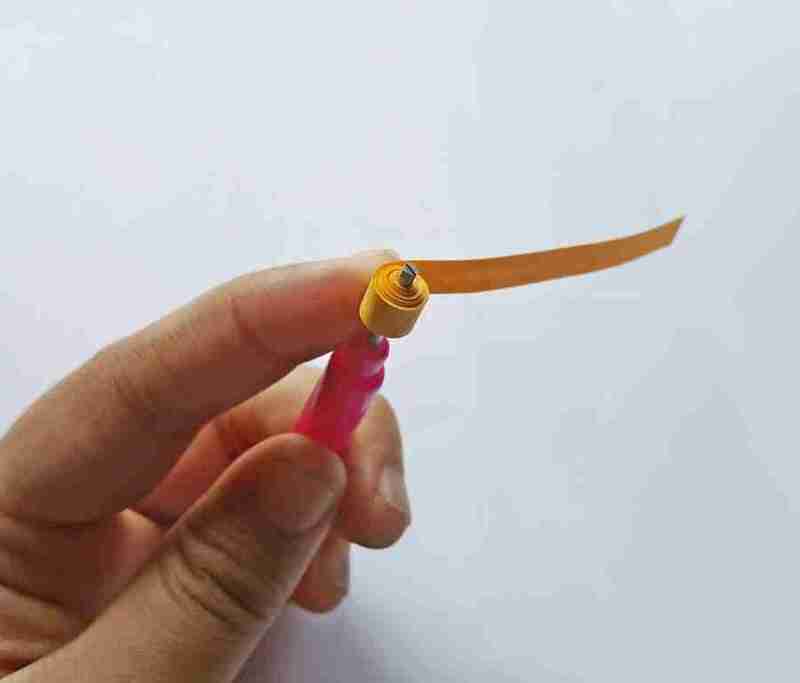 Tighten the coil again around the bead by holding it between 2 fingers and pulling the end of the paper strip. Apply glue at the end to secure the coil. This will be the center of the flower. Select a different colored strip and quill it using the slotted quilling tool. After quilling the strip carefully take it out of the tool. Allow the coil to loosen up a bit by placing it on a flat surface. Take the loose quilled pattern and press any one side to create a pointy edge. We’ve created a teardrop pattern. Now press the opposite side of the pattern to create another pointy edge. Now, we’ve created a basic eye pattern. and create 3 eye patterns using a different colored strip. 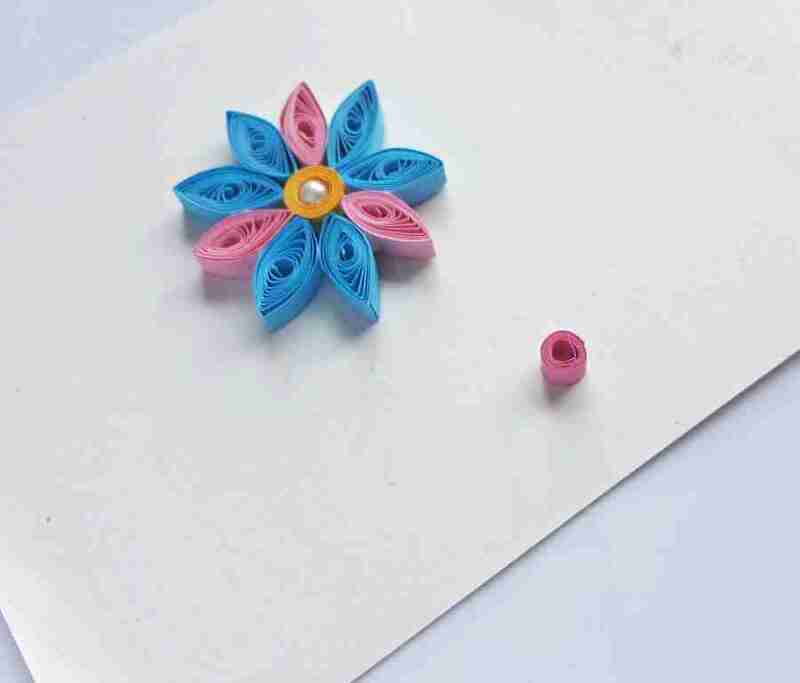 Take a piece of paper and place the center part of the flower on the paper. 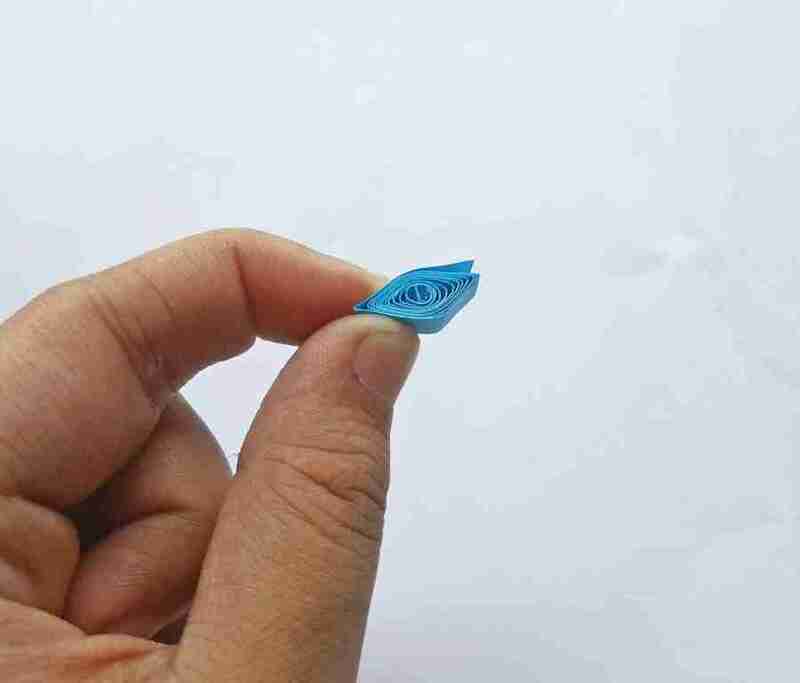 Take any 2 basic eye patterns from the 6 and attach them to the center part with glue. and attach it next to the other flower petals. attaching 2 same colored eye patterns and then 1 other colored eye pattern. Create another tight coil with a relatively bigger loop on the center. 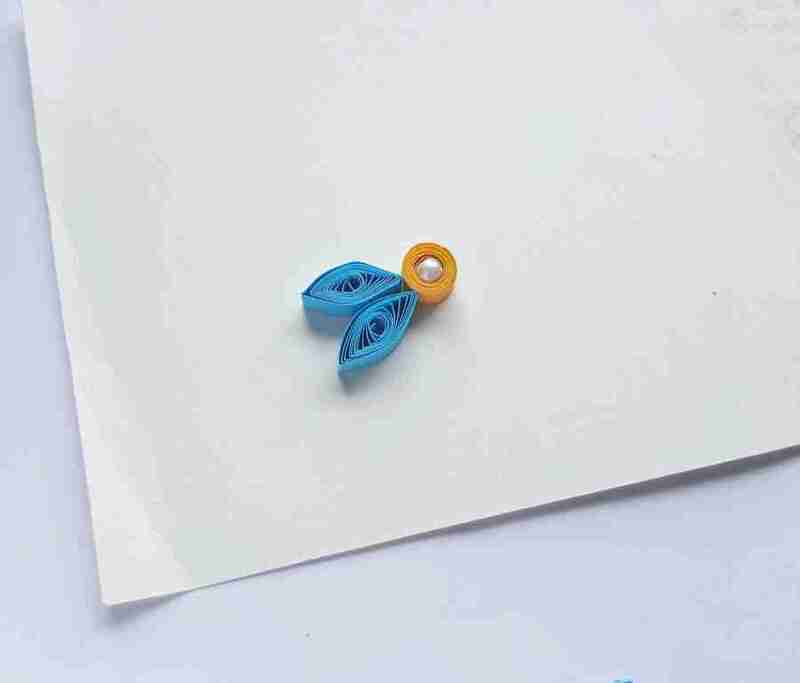 Attach the coil to the flower pattern between any 2 petals. Attach a jump ring through the loop of the coil to complete the pendant. Your flower is done. 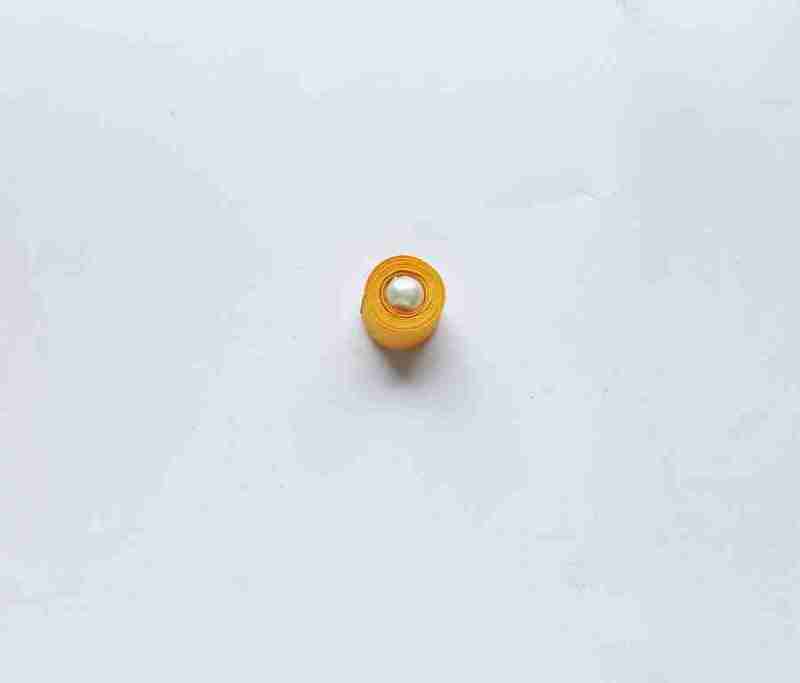 Slip it onto your chain or string along with any additional beads or embellishments that you think will compliment your creation! 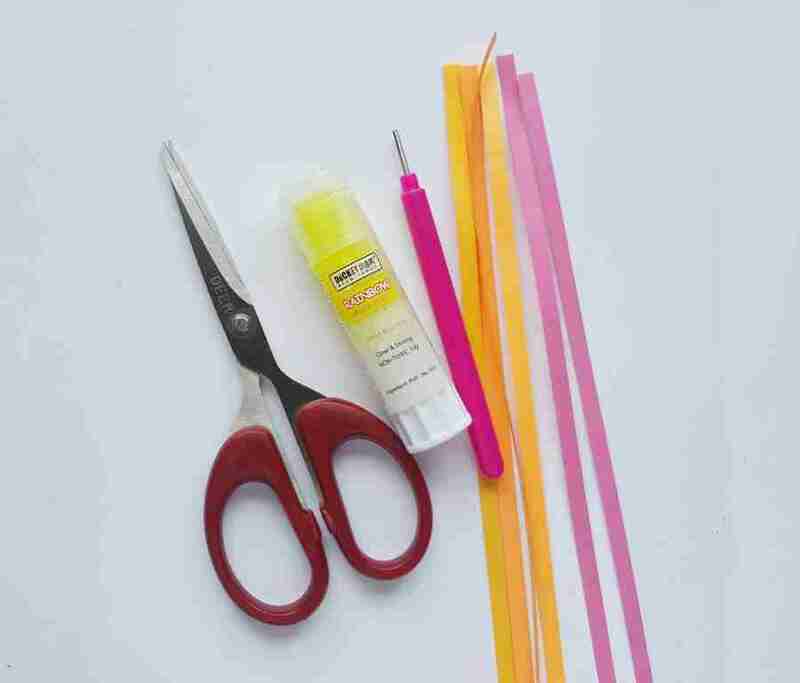 Select a paper strip to get started and use the slotted quilling tool to quill the strip. 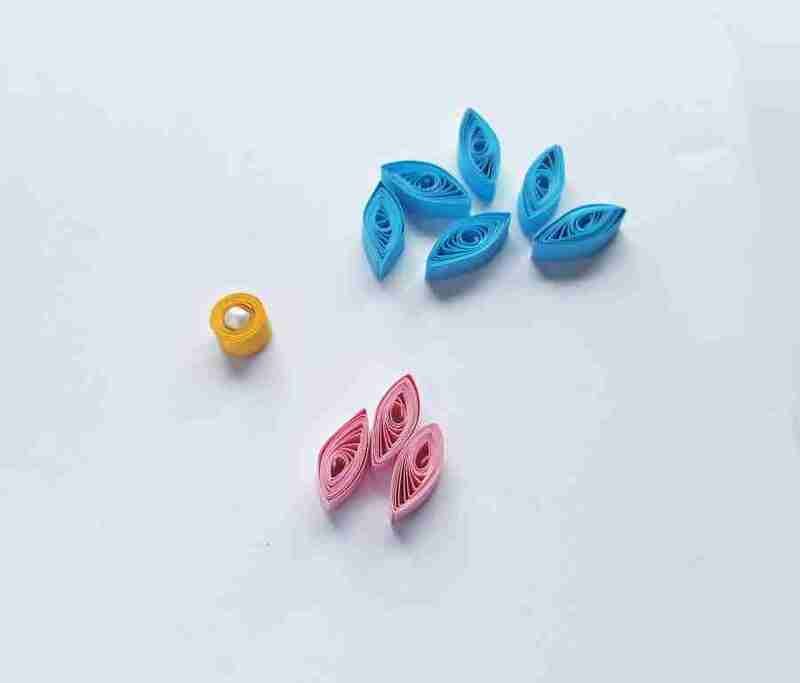 After quilling the whole strip carefully take it out of the quilling tool, making sure that the quilled pattern is secured. Allow the quilled strip (coil) to loosen up a bit. 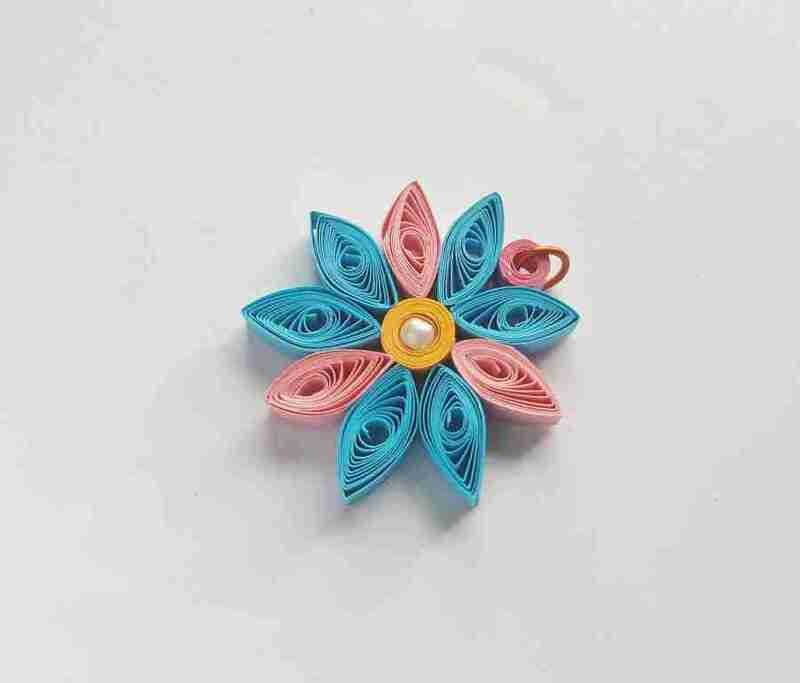 Place the loose quilled strip on a flat surface and attach a small faux bead on the center of the quilled pattern. 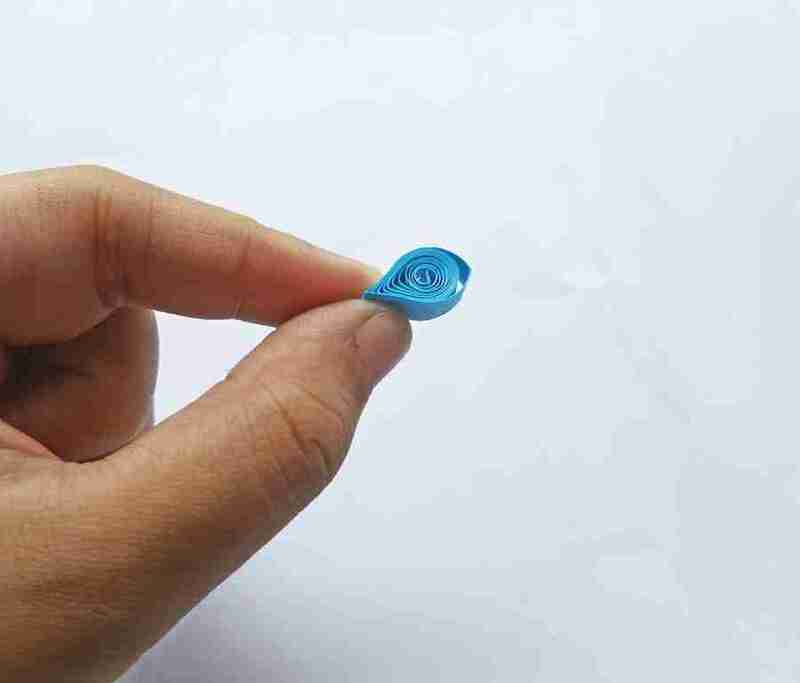 Tighten the quilled pattern again by holding it between 2 fingers and pulling the open end. Once the center part has tightened roll the rest of the strip around it and apply glue at the end to secure the pattern. This will be the center of the flower. 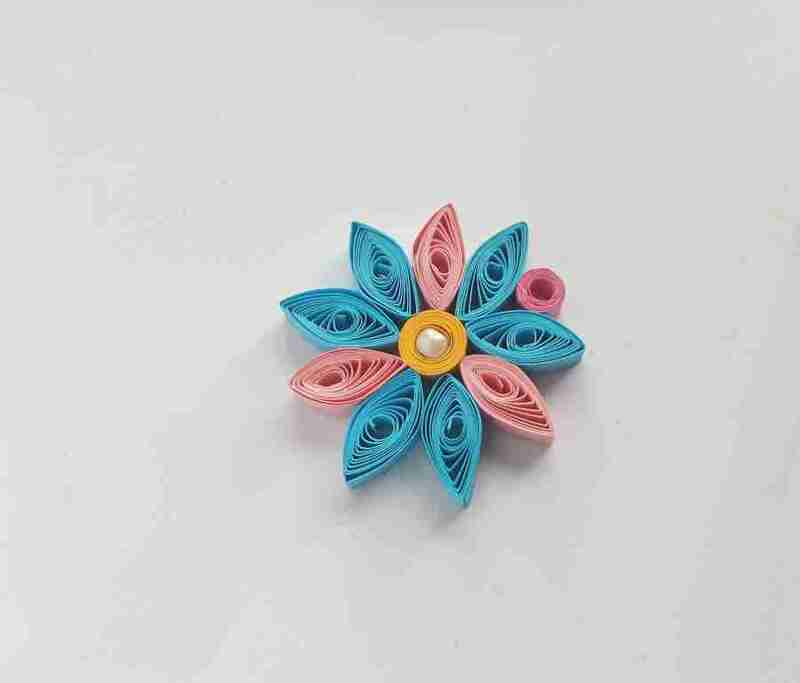 Select a different colored quilling strip and quill it using the slotted quilling tool. 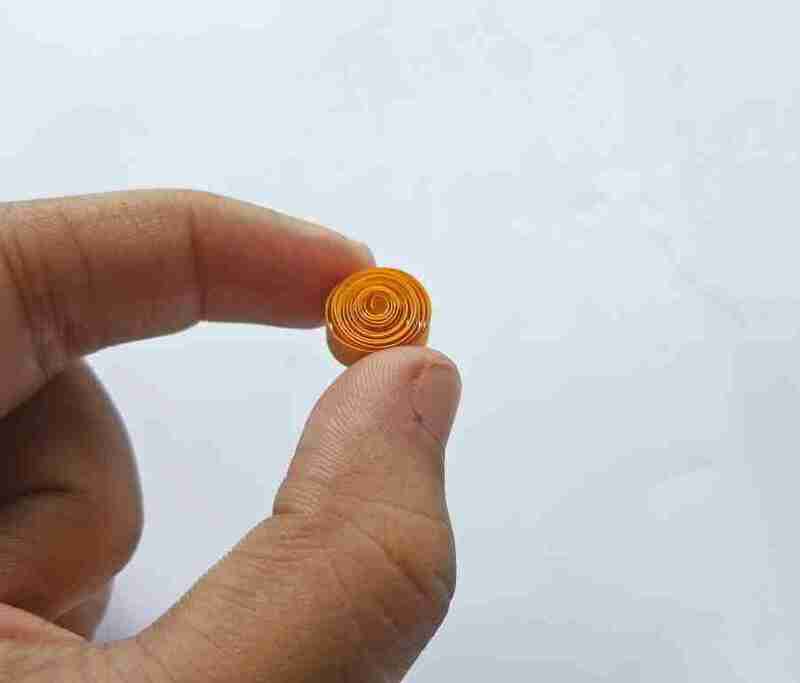 Allow the quilled strip (coil) to loosen up a bit by placing it on a flat surface. Take the loose quilled pattern and press any one side to create a pointy edge. We’ve created a teardrop pattern. Now press the opposite side of the pattern to create another pointy edge. Now, we’ve created a basic eye pattern. Similarly create 5 more basic eye patterns using the same colored strips (total 6) and create 3 basic eye patterns using a different colored strip. 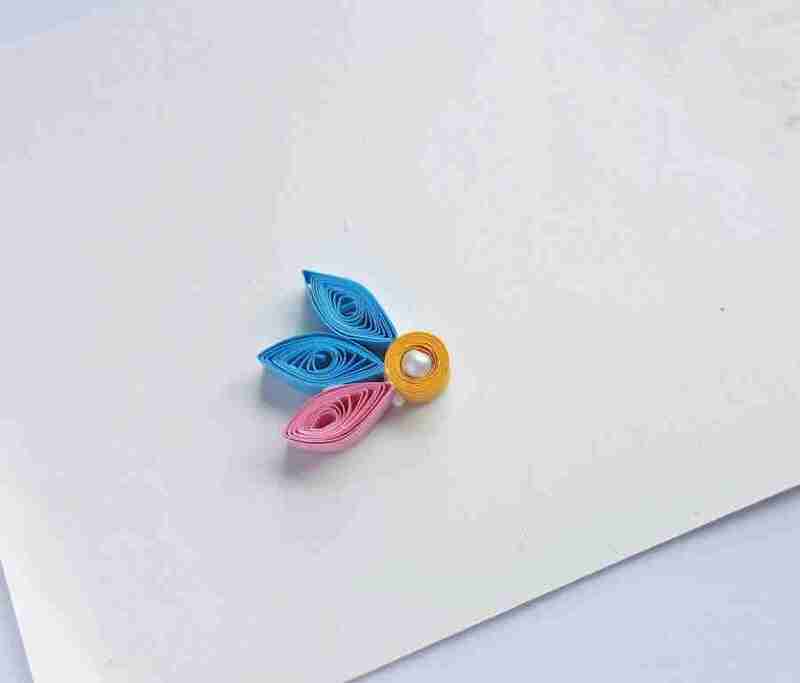 Take a piece of clear paper or glossy paper and place the center part for the flower created in step 5 and place it on the paper. Take any 2 basic eye patterns from the 6 and attach them with the center part. 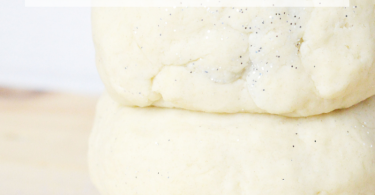 Attach any of the pointy edges of the eye patterns with the center part. Now take any one of the eye patterns from the 3 and attach it near the previous 2 patterns; with the center. Now repeat the step 12 and 13 until reaching the first eye pattern; attaching 2 same colored eye patterns and then 1 other colored eye pattern. Create a tight coil with a relatively bigger loop on the center. 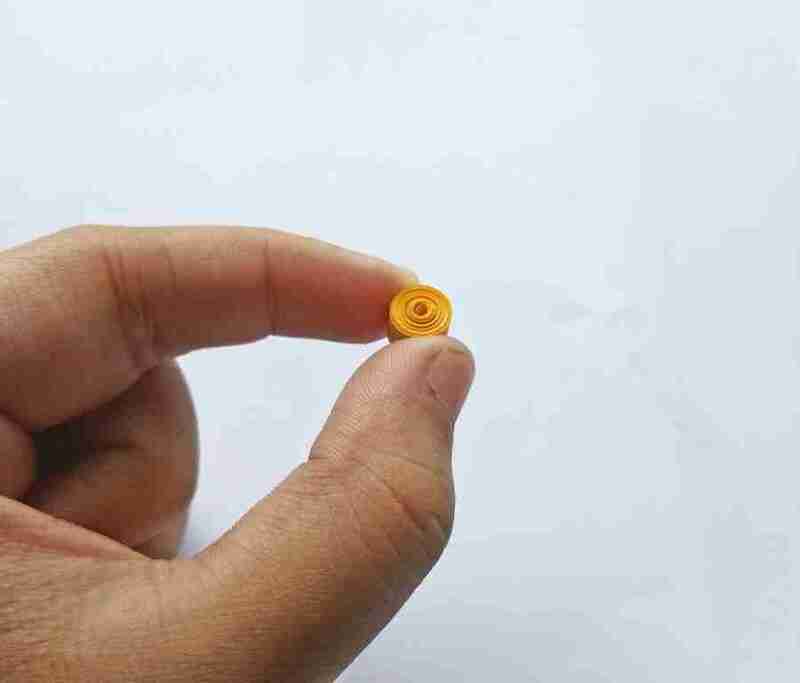 Attach the coil with the flower pattern between any 2 petals. Attach a jump ring though the loop of the coil to complete the pendant.